There’s a wealth of information to be gleaned, but several hurdles need to be leapfrogged. Social media technologies and their popularity have exploded in the past decade, and it’s not just patients who are getting in on the action. Physicians and health care organizations alike are increasingly utilizing text messaging, Twitter, Facebook, and other social media technologies in an effort to explore their potential benefits. Thus far, most of the research in this area has focused on social media technologies as marketing tools, a way to listen to what patients are saying about their experiences and engaging them. “[In the PwC research paper], we gave examples of how hospitals are using social media, and they are not limiting their imaginations to just marketing and listening to people’s feedback about the company; they are starting to think about how to use social media for services and other aspects of their business,” says John Edwards, a PwC spokesperson and director in the Healthcare Strategy & Healthcare Business Intelligence Practice. Edwards cites a 2012 research statistic from the Hospital Social Network List that shows more than 1,200 US hospitals now are using social media sites, a 30% increase from the previous year. “That is a pretty significant trend toward adopting social media, so it would suggest that hospitals are finding uses for social media as part of their strategies, and that it’s a growing trend,” he says. But what about taking social media one step further and using it as a health record tool? What benefits could be seen from including social media exchanges in the patient record, and would such benefits override the obvious—and not-so-obvious—obstacles that arise? A Place in the EHR? Social media and health care experts seem to agree that social media exchanges could add important and interesting information to the care process, but where exactly this information fits in—and how to go about incorporating it—is up for debate. Rhoads says incorporating social media interactions into the patient record can enhance care management, patient adherence, and even patient safety. “For instance, caregivers could learn more about how a patient is feeling, how a patient is responding to a new medication, and whether a patient is adhering to a certain care plan,” he notes. Kohn notes that Practice Fusion already has incorporated social-media-style messaging for physician-to-physician communication into its EHR. Thielst says that in addition to social technologies such as text messaging, blogging, social networking, and avatars being easy to use and familiar to consumers, they “are also convenient, engaging, and efficient for facilitating communication and scaling to accommodate population health needs. 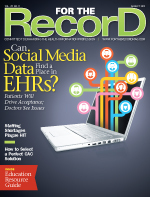 PwC strongly supports the idea of building a more complete patient record through social media data, according to Edwards. “I think that some aspects of social media, such as self-reported conditions and outcomes associated with being on certain treatment protocols, could be really useful and interesting to have available,” he says. While the idea may have promise, Edwards isn’t sure whether the EHR is the best place for that information. Many clinicians would likely balk at that possibility, at least given the lack of controls that can come with this type of information. “The idea of including social media content as part of the electronic health record would probably get some significant resistance internally from a hospital’s clinicians,” he says. However, he notes patients in the Internet Age often come to office appointments armed with information—as well as misinformation—about their health care conditions. And unless there’s a clear way to distinguish highly controlled information from questionable data, Edwards says many clinicians likely will fight against its inclusion in the EHR. The information should be supplemental in nature and never viewed as replacing or overriding data obtained directly through inpatient visits and other face-to-face interactions. “This is the bare minimum needed for quality control,” Rhoads notes. Managing the inherent risks related to sharing social media information comes down to policy, Rhoads says. “Risks like privacy, security, and liability can be managed, but it means starting from scratch and designing policies that are suited specifically to your institution and then making sure that you’ve adequately trained everyone on them,” he says. For the most part, speculation is the name of the game when looking at how social media exchanges may be incorporated into EHRs. However, there are a few possibilities to consider. Vartabedian envisions a future in which EHRs will have built-in social elements to allow for physician-patient communication in a HIPAA-compliant, private venue. “I can imagine five years from now coming out of an exam room and going to a screen, on my left having an EHR and on my right having a Twitter-type screen where, while I’m sitting there, a pediatrician I work with sends me a message about a patient in his office,” he says. “I quickly message back about what he should do, and that message is then tagged to the patient so that it goes directly to the EHR. Then the next time that patient is in the office with me, it’s part of the record. Judging by the 30% increase in the number of hospitals using social media and the fact that 50% of health care providers use social media, the technology definitely is making a dent in the industry, says Edwards, who’s unsure if the trend will extend into the EHR world. “Time will tell,” he says. From a legal and eDiscovery perspective, Kohn advises organizations to ask themselves the following questions: Does the social media content document a transaction or a care decision? Could the content be subject to requests for disclosure, subpoena, and eDiscovery?